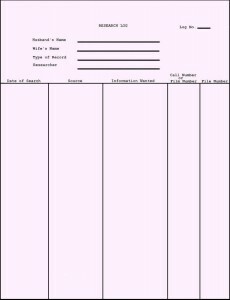 The Index to Research Findings, the Research Log, and the Correspondence Index can show at a glance what has been searched, what was found (if anything), and where the next step might be taken. This chapter will give a brief overview of these forms and their uses. The purpose of the Research Log or Calendar of Search is to show what sources have been searched, what information was looked for, what was found, and what the next step(s) may be. 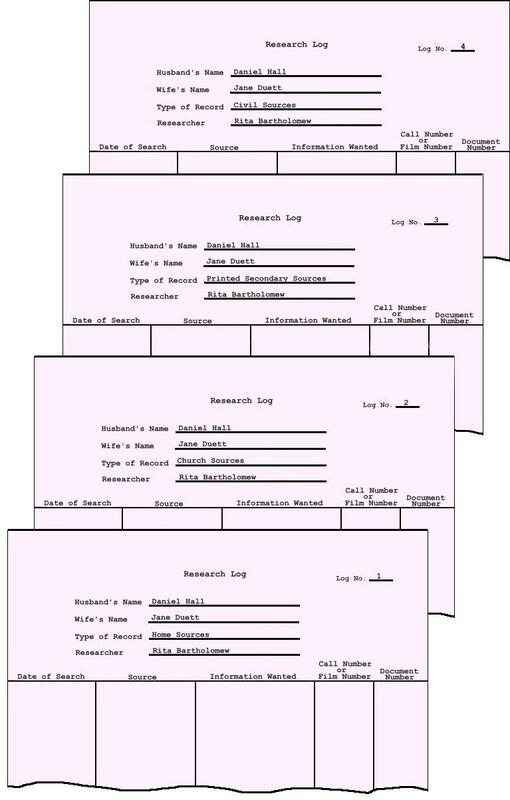 Since each family unit is often recorded in several types of records, (for example: home, civil, census, church) it is easier to check to see what has been searched in any given record category if each category has its own Research Log. To make cross-referencing easier, each log may be given a number. 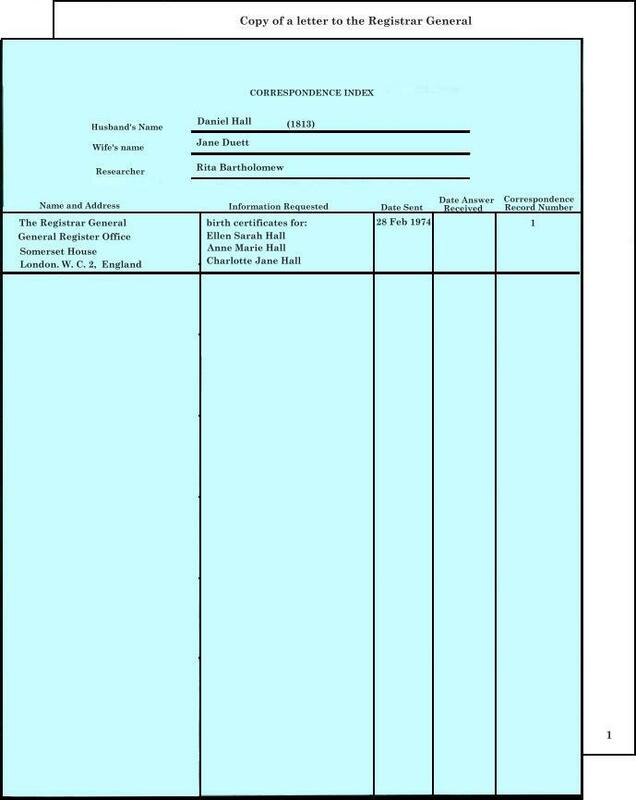 For example: Research Log #1 may be Home Sources, Research Log #2 may be Church Records, etc. If desired, letters (A, B, C, etc.) may be used instead of numbers. There may, therefore, be several Research Logs in each family folder. 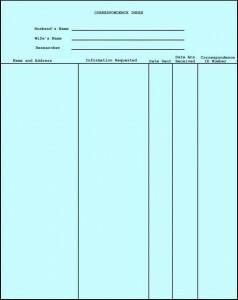 The purpose of the Correspondence Index is to enable you to see at a glance which letters gave you information, which letters have received no reply, and addresses of persons you wish to write. 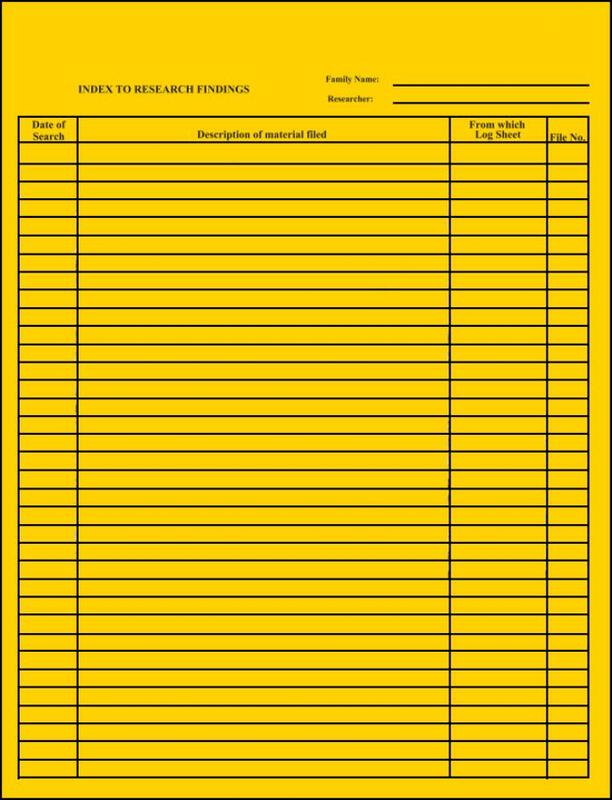 A copy of each letter should be kept and numbered. This number is recorded on the Correspondence Index to facilitate finding the letter when it needs to be referred to again. When a reply to a letter is received, the reply should be fastened to the copy of the letter it answers. This makes it possible to have both the questions and answers together. The filing of correspondence and genealogical information received through letters will be covered later. The purpose of the Index to Research Findings is to help retrieve information from your documents and research notes. 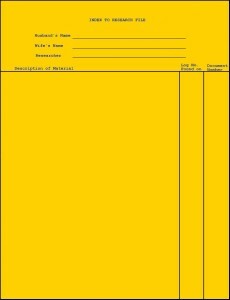 The documents and research can be indexed several ways. 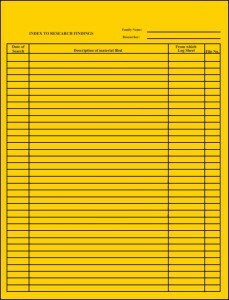 One way to list the documents is by individual. 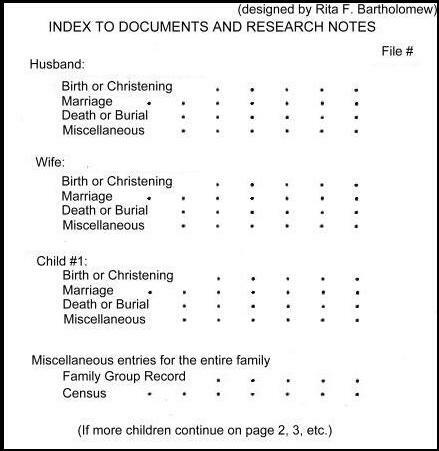 This index shows what information you have found on each person in a family. Another way to index the records is through a listing of the records found, similar to a table of contents. 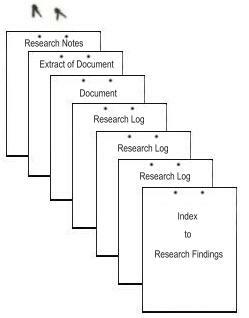 Within each Family Research Folder, the following filing order is suggested: the Index to Research Findings, followed by the Research Logs, and then the research notes and documents. These pages are then fastened together with some type of metal fastener. 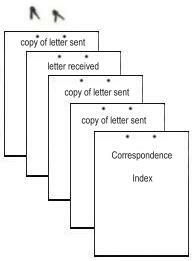 In the same folder place the Correspondence Index with copies of letters sent and replies received, fastened together. Color-code these three forms to find them quickly. 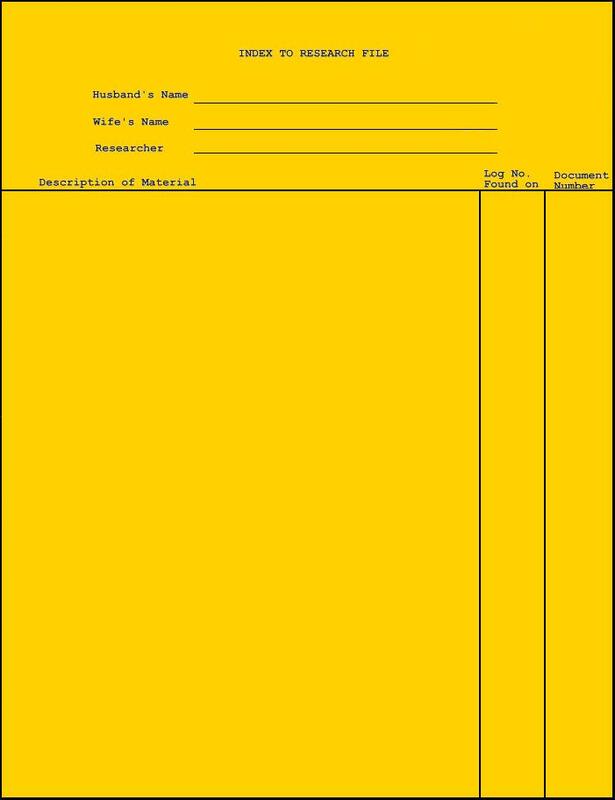 For example: yellow for the Index to Research Findings, pink for the Research Logs, and blue for the Correspondence Index.